VIEW AT YOUR LEISURE IN OUR HEATED SHOWROOM..... YOU WILL NOT FIND ANOTHER LIKE THIS.... ONLY 2 FORMER KEEPERS WITH 14 SERVICE STAMPS INCLUDING CAM BELT CHANGED..... FINISHED IN THE BEST COLOUR COMBINATION OF METALLIC BLACK WITH FULL BLACK LEATHER UPHOLSTERY INCLUDING LEATHER STEERING WHEEL & GEAR GAITER WITH BRUSHED ALUMINIUM DASHBOARD & DOOR TRIM..... HUGE SPECIFICATION INCLUDING: HEATED SEATS, AUTOMATIC HEADLIGHTS, CRUISE CONTROL, ELECTRIC TILT & SLIDE SUNROOF, CLIMATE CONTROLLED AIR CONDITIONING..... SUPPLIED WITH 12 MONTHS PARTS & LABOUR WARRANTY WITH NATIONWIDE COVER & 12 MONTHS AA BREAKDOWN COVER..... 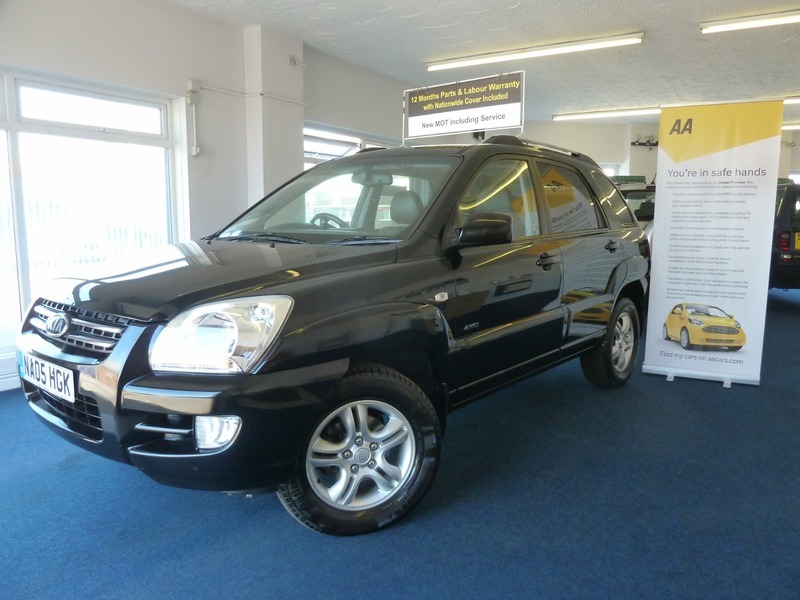 STUNNING 05 REG KIA SPORTAGE 2.0 XS CRDI TURBO DIESEL 5 SPEED 4X4. ONLY 119,000 WARRANTED MILES (AVERAGE 8500 MILES PER YEAR). NEW MOT UNTIL 19TH MARCH 2020 (WITH NO ADVISORIES) INCLUDING SERVICE WITH NEW FRONT BRAKE PADS & DISCS FITTED. 14 SERVICE STAMPS, SERVICED BY RICHMONDS KIA MAIN DEALER AT: PDI, 19169 MILES & 37121 MILES. SERVICED BY F.CROSS CHASESIDE AT: 52752 MILES, 57997 MILES, 62797 MILES, 67746 MILES, 71466 MILES, 76066 MILES, 82088 MILES, 88006 MILES & 92508 MILES SERVICED BY FORMULA 1 AUTO-CENTRE AT: 108462 MILES INCLUDING CAM BELT CHANGE. SERVICED BY OURSELVES AT 119472 MILES WITH NEW MOT. ONLY TWO FORMER KEEPERS FROM NEW. ALLOY WHEELS FITTED WITH EXCELLENT MATCHING CONTINENTAL TYRES ON FRONT & DUNLOP TYRES ON REAR WITH 5MM TREAD. SUPPLIED WITH OWNERS MANUAL, KIA CARPET MATS & RETRACTABLE REAR LOAD COVER. FITTED WITH TOW-BAR WITH ELECTRICS, PRIVACY GLASS & FRONT & REAR MUD FLAPS. FANTASTIC LUXURY, ECONOMICAL, GO-ANYWHERE & ULTRA RELIABLE KIA MOTORING OFFERING AVERAGE 40 MILES PER GALLON & ONLY £290 PER YEAR ROAD TAX OR £25.38 PER MONTH ON DIRECT DEBIT. HUGE SPECIFICATION INCLUDING: HEATED SEATS, AUTOMATIC HEADLIGHTS, CLIMATE CONTROLLED AIR CONDITIONING, JVC CD PLAYER, ELECTRIC TILT & SLIDE SUNROOF WITH SUN-BLIND, CRUISE CONTROL, TRACTION CONTROL, 4WD LOCK, FRONT & REAR ELECTRIC WINDOWS, ELECTRIC MIRRORS, CD STORAGE, DRIVER & PASSENGER ARMREST WITH STORAGE, 12V POWER SUPPLY, HEIGHT ADJUSTABLE DRIVERS SEAT, HEIGHT ADJUSTABLE STEERING WHEEL, ROOF MOUNTED SUN-GLASSES HOLDER, AUTO-DIM REAR VIEW MIRROR, TWIN VANITY MIRRORS, MULTIPLE AIRBAGS INCLUDING SIDE IMPACT AIRBAGS, STORAGE COMPARTMENTS IN REAR OF FRONT SEATS, 3 X 3 POINT REAR SEAT BELTS, ISOFIX, 60/40 SPLIT FOLDING REAR SEATS, REAR ARMRESTS, REAR READING LIGHTS, REAR HEADRESTS, REAR DRINKS HOLDER, 12V POWER SUPPLY IN BOOT, STORAGE COMPARTMENTS IN BOOT, FRONT FOG LIGHTS, ROOF BARS, SPLIT OPENING TAIL-GATE GLASS, REMOTE LOCKING & ALARM, COLOUR CODED. Please Note: For Further Information Please Contact Us On 01384 429630 Or 07825 137260. The Vehicle Is Supplied With A 12 Months Parts & Labour Warranty With Nationwide Coverage & Unlimited Mileage, Extendable If Required. Free 12 Months AA Breakdown Cover. Any Trial Or Inspection Welcome. Viewing By Appointment. Please Call For More Details. Open 7 Days Til Late. Part Exchange Welcome, Please Contact To Agree Value. All Vehicles Are HPI Checked. All Major Credit & Debit Cards. We Are Located 5 Minutes From The Merry Hill Shopping Centre At Cradley Heath, West Midlands, B64 7AA. 10 Minutes From Junction 2,3 & 4 Of The M5. We Can Tax Your Car Ready For Collection If Required. Please Check Our Customer Reviews And Buy With Confidence, We Have Been Selling Cars For Over 20 Years & Customer Satisfaction Is Paramount. We Can Arrange Pick Up From Cradley Heath Train Station Which Is A 20 Minute Journey From Moor Street Station, Birmingham. Delivery Can Be Arranged, Please Enquire For Price.